Last week we had a brief look at why statistical thinking could assist us in the coming machine age. Today we take another peek under the hood of statistical thinking. Don't worry, we still are not going to do any mathematics. We are just going to look at another aspect of statistical thinking from a conceptual perspective. Today we are going to take a look at the Bell Curve. Also called the "normal distribution" or the "Gaussian distribution". I am sure that most of you would have been introduced to the Bell Curve before, but today I want to show you how to use it to help us make everyday decisions. Just to remind you, we are looking at these topics because our current hypothesis is that the micro-entrepreneur model for work is what we will have to live with in the machine age. It is therefor a good idea to start building up some machine age entrepreneurial skills. In many systems around us, the variation tends to fall within the so called "normal distribution" or "Bell Curve". Basically what this means is that if we take a lot of data and plot the value we are measuring (say the height of people) against the number of people with that particular value for height, then the graph it forms is in the shape of a bell. The flatter and broader the bell shape, the more scatter there is in the data. The narrower and higher the bell curve is, the less variation there is in the data. A very common measure of how much variation there is in the data is a statistic called the standard deviation. We will not go into how that is calculated. Mostly we do not need to know how to do these calculations, because we can just use a spreadsheet to calculate it for us! 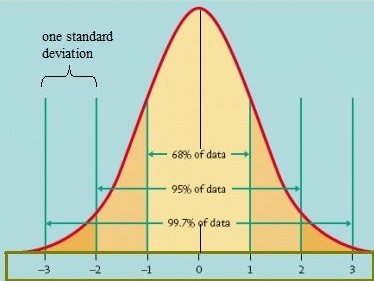 The Bell Curve: The standard deviation is a measure of the variation in the data. The bottom axis is the standard deviation, and the vertical axis is the number of data points falling within a specific range. What is important to notice is that 68% of all the data points will lie within plus and minus one standard deviation from the mean value of the data. In our example, 68% of all people will be of a height that is within 1 standard deviation above or below the average value. Incredibly, 95% of all people will have a height that is within plus or minus 2 standard deviations. So, what does this have to do with decision making I hear you ask? Well, I am so glad you asked! What is important to notice, is that in a "normal distribution" (and there are other types of distributions) the outlier values are rather low probability scenarios. In other words, in most typical systems that we interact with, we should not expect extreme values very often. In economic terms, we seldom see crashes and depressions. We also seldom see boom times. Mostly things are somewhere in the middle, and every now and then things move to the extreme for relatively short periods of time. When we go eating out, or go to watch a movie, only seldom do we experience WOW or terrible. Mostly we just have a reasonably average experience. So, as an entrepreneur, if your business plan is based on experiencing extreme events, then you will probably fail. That is why insurance companies are such good businesses. We are afraid of the extreme events, so we pay the insurance company to carry that risk. Mostly, those extremes do not happen, so the insurance company can pocket the money. On a more personal basis, it also shows us why those people always forecasting doom or heaven, are seldom right. The doom and gloom types predict catastrophe for years on end before something happens that even remotely resembles what they were predicting. Those predicting that this or that business will turn us into millionaires because something "way out" is going to happen, mostly leaves us disappointed. So, whenever you see some prediction of an event on which you should act, always ask yourself where on the bell curve that event lies. If it is anywhere far from the average value, then it is a low probability event, and you need to make your decision accordingly. The black and white people of this world tend to believe that the world is binary. While there are certainly binary systems, most of the systems that we deal with on a daily basis follow the bell curve. In the grey world we live in, black and white are low probability outcomes. The flip side of the bell curve is that it shows us that if we do find ourselves in an extreme situation, then the probability of things moving towards the average or "mean" value is quite big. So, if there is an economic boom, (a rare event) and you decide to establish a business that is only viable under boom conditions, then you need to understand that it will be a short term business. Sooner rather than later, economic conditions will revert to the mean. Often this means that it will "overshoot" in the other direction. So, it is clear that projections need to be made after thinking about where you are in the bell curve at the moment, and where things are likely to head in the near to middle term. If you are at extremes, then think about what will happen when conditions or prices or interest rates or whatever, revert to the mean, because it is around the mean that you will be spending most of your time. Wild optimism and wild pessimism are neither good points of view in business. While we can think in those terms to "test the limits", a higher probability of success is found in the grey middle. We can now see where a lot of the sayings and idioms in life comes from. Remember that fear and greed are signs of extremes. When we are experiencing extremes, then things are liable to move in the other direction. Keep this in mind when snake oil salesmen or worry warts come calling. Develop a feeling for what "average" is in any situation before making important decisions. Only once you know this can you make a sound decision. Beware of letting people use your emotions to push you into the low probability outcomes. More often than not, you will end up being the poorer for it. P.S. Have you made an extreme probability decision? How did it turn out for you? Please share your stories, opinions and insights regarding today's topic, directly on the e-zine page on the WelderDestiny website.